Want exclusive exposure, backlinks to your blog and social media promo ALL FOR FREE? As a thank you to our subscribers, we feature one blogger each edition. Our feature blogger gets promoted on front page and delivered first to our exclusive email list, and then posted in our editorial section forever. You can keep bragging rights and backlinks! We also provide exposure through social media promo across the web. The deadline for Steph Social’s Seasonal Editorial for Summer 2019 is approaching. If you want in on a slice of this social pie, subscribe! If you’ve already used our pop up to subscribe, than you’re good to go! Otherwise, you can sign up below! 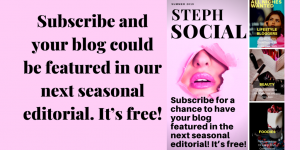 Sign Up For Steph Social’s Editorial Now! "Get Your Slice Of The Social Pie"
Steph Social's Seasonal Editorial features hot and fresh content from our team as well as bloggers like you. Join Steph today and you could be our next feature blogger! We enjoy trying new recipes, and so do our husbands. Let us share some of your greatest treats with our readers! Life is so good. Share your passion for life with us and our readers. Hobbies, travel beauty tips- we love it and our readers will too! We want to hear it all- parenting hacks, fails, self-care tips, life-saving mom products. Please share! We want to add you to our sweet collection of bloggers. Follow us and subscribe so we can show you off! Affiliate Marketing Made SO Easy, For Every Niche! Is Your Home An Anxiety Trigger? The One Where FRIENDS Happened Today! Steph’s Social Pie will use the information you provide on this form to be in touch with you and to provide updates and marketing. Steph Social will use the information you provide on this form to be in touch with you and to provide updates and marketing.